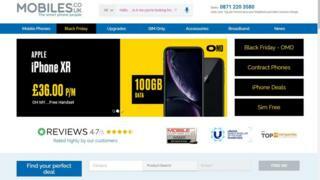 The ad, part of a Black Friday promotion, appeared on mobiles.co.uk - a division of Carphone Warehouse. "If promoters relied on being able to meet the estimated response but were unable to supply demand for a promotional offer because of an unexpectedly high response or some other anticipated factor outside their control, they must ensure relevant timely communication with applicants and consumers and, in cases of any likely detriment, offer a refund or a reasonable substitute product," it said in its ruling. A spokesperson for mobiles.co.uk said: "We're disappointed by the ASA's decision but we take on board their recommendation to increase the level of communication to customers if something similar were to happen again." The problem seemed to rest with Vodafone's credit check system which was incorrectly turning down some applications. The BBC understands about 5% of customers experienced an issue.